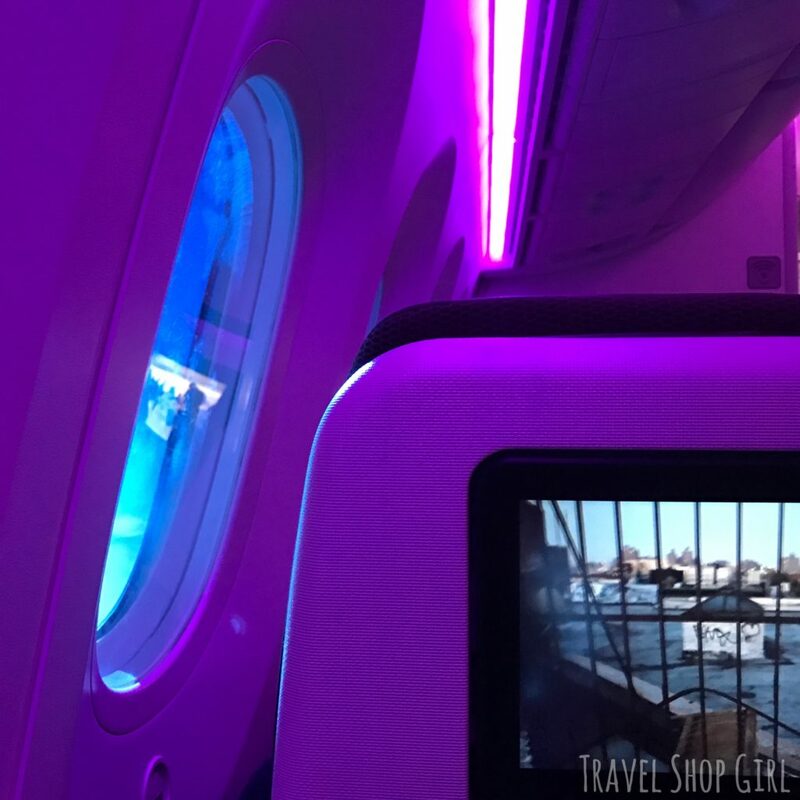 Time to go off and explore again and I recently had the chance to fly in Virgin Atlantic Premium Economy class from Boston to London Heathrow airport and back home again to Boston. 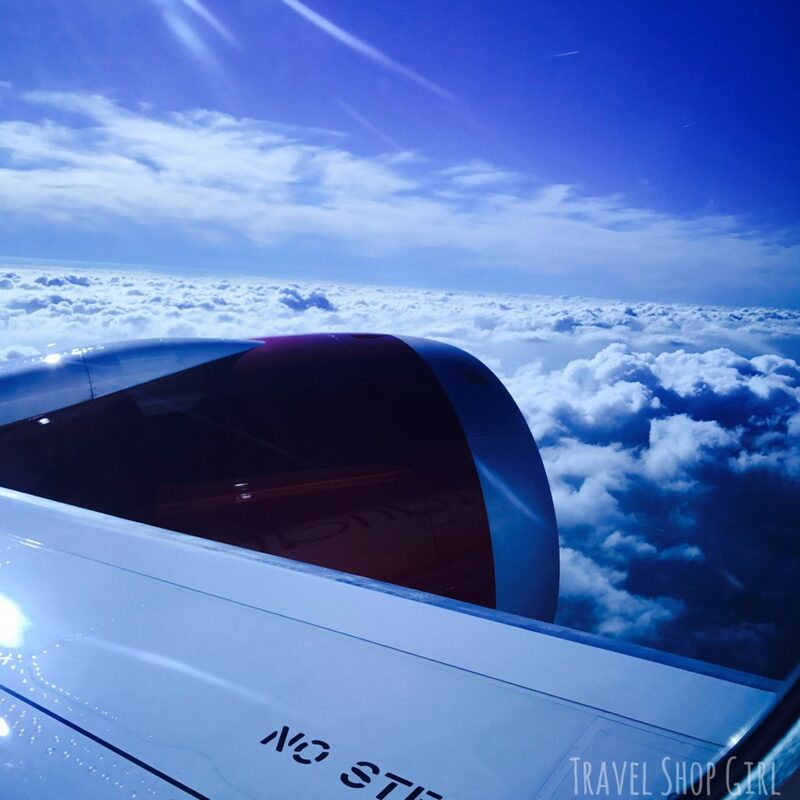 I’ve previously experienced Upper Class with Virgin Atlantic so I was excited to experience how the Premium Economy service would stack up in comparison not only with Virgin Atlantic, but also with British Airways World Traveller Plus, British Airways’ Premium Economy product. 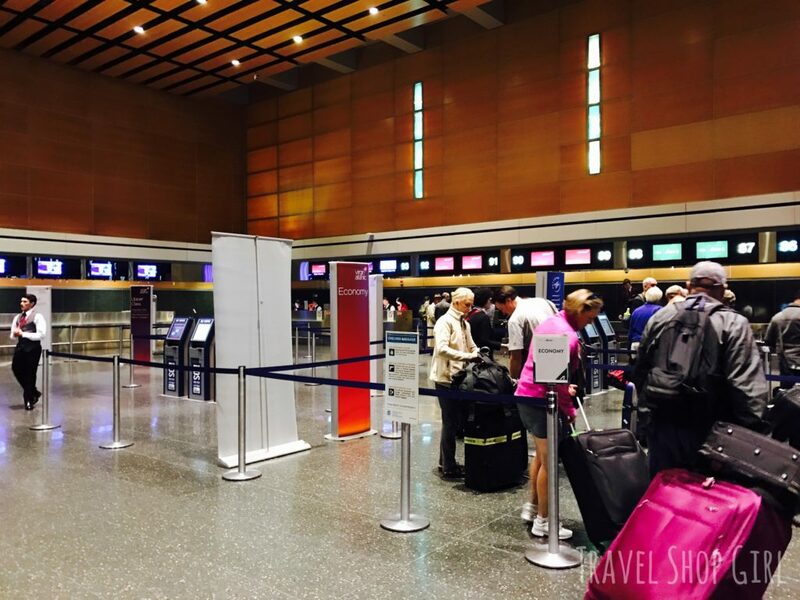 I arrived at Terminal E at Boston Logan International airport and flew right by the long lines for Economy class and went right to the check in counters for Premium Economy. Out of curiosity I asked about an upgrade to Upper Class which turned out to be $1200 for the flight, more than my entire ticket. I was able to get a great deal and a really reduced fare with my Flying Club points so no upgrade for me on this flight. 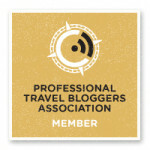 I checked my bags (Premium Economy customers are allowed two bags up to 53 lbs. (23 kg.) and walked only a short distance to the security lines. 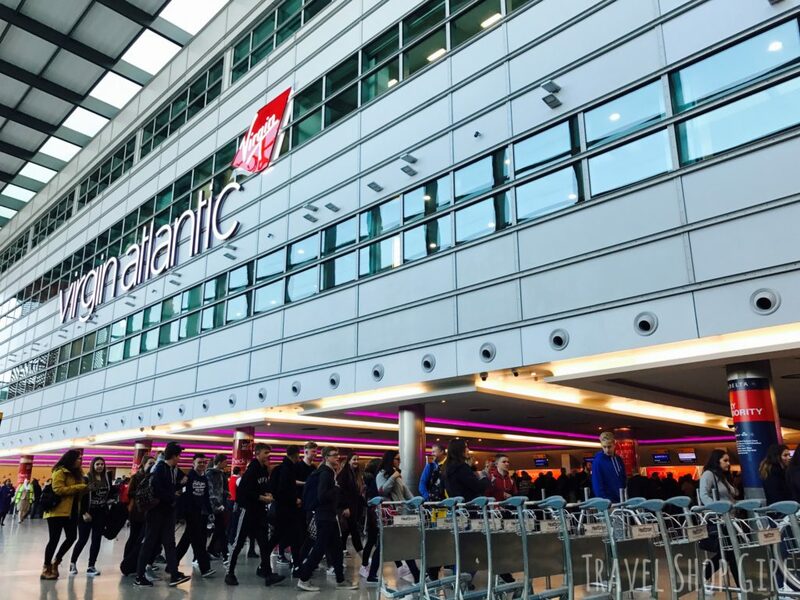 Once through security, it wasn’t long before it was time to board Virgin Atlantic flight 12 to London. 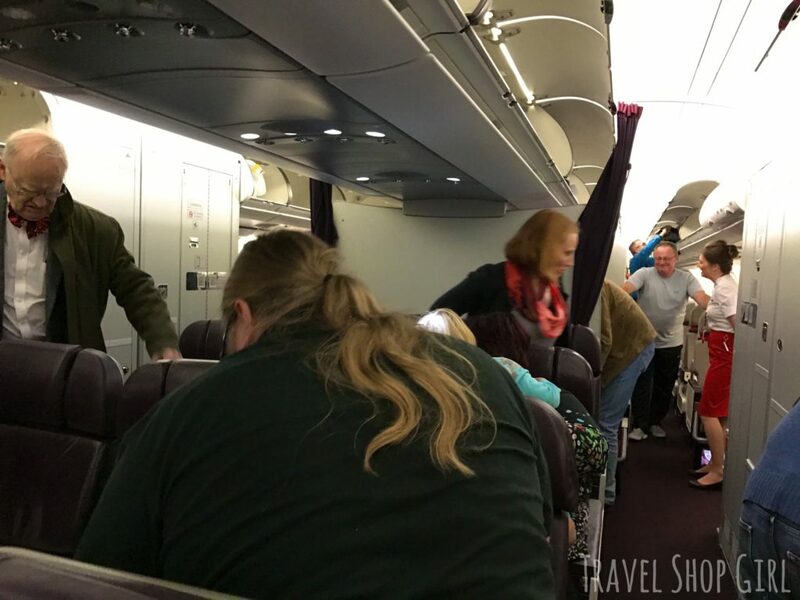 Premium Economy passengers board right after Upper Class passengers and before Economy. Passengers enter through the door that separates Premium Economy from Upper Class. On our flight to London we were flying in an old school A340-600 that had seen better days. This guy was seated behind me and kept kicking and moving my seat as well as grabbing my hair with the seat every time he stood up. Seats on this airplane are somewhat rigid with hard armrests between you and the passenger next to you, but otherwise comfortable. There is a foot rest, which is nice for someone like me on the shorter side. 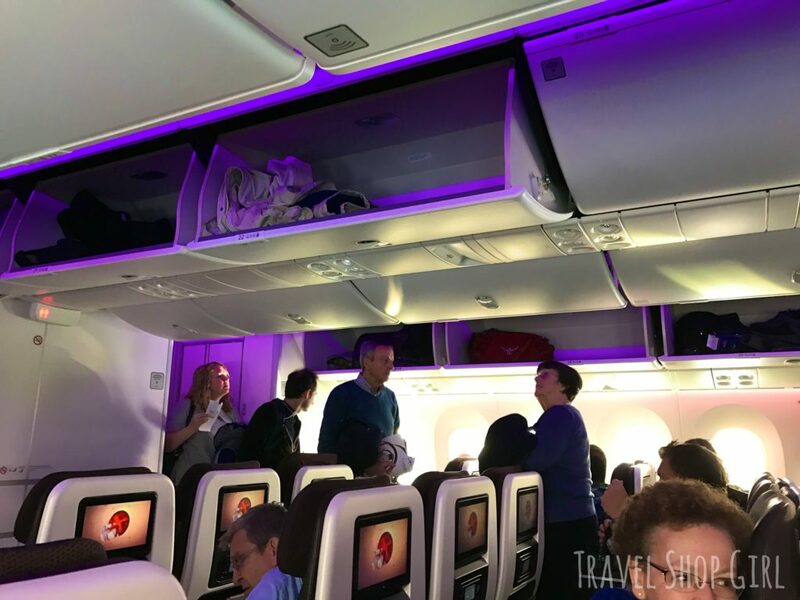 The overhead bins with Virgin Atlantic Premium Economy on this flight were the standard size, but with fewer seats in each row than Economy, that makes for less fighting over space. Before takeoff we were provided a choice of orange juice or champagne and I, of course, chose the champagne. With beverage service shortly after takeoff, we were giving Penn State pretzels, a yummy alternative to the standard same old, same old pretzels normally seen on flights. I’m not usually a wine drinker, but thought it might help me fall asleep, so why not? 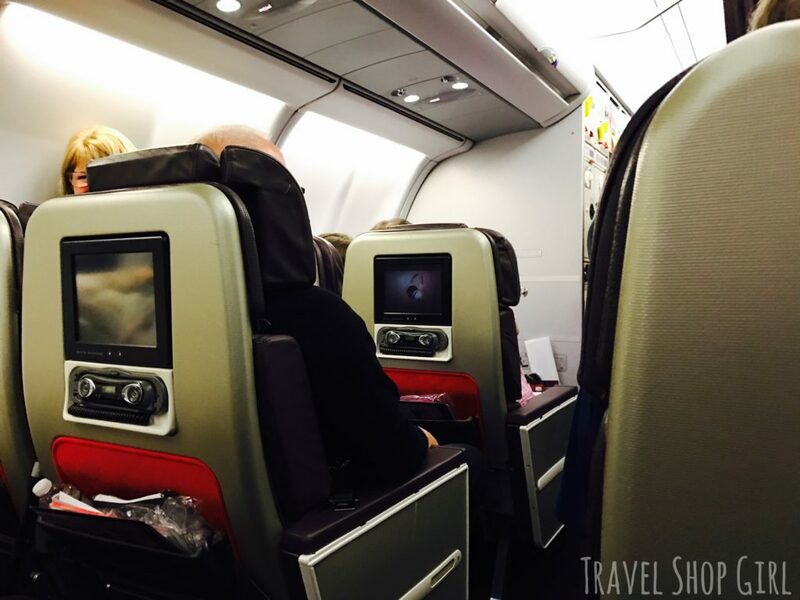 The seat configuration in Premium Economy on the A340-600 is 2 x 3 x 2 compared to 2 x 4 x 2 in Economy. The Herschel amenity kit for my overnight flight included the basics: Earplugs, sleep mask, pen, travel socks, toothbrush and toothpaste. Although I had pre-ordered the vegetarian meal when I booked my flight, I decided to still look over the menu. I probably shouldn’t have done this as the vegetarian meal was lackluster at best. My tray included a salad, fresh fruit for dessert, and an Indian entrée. I hadn’t eaten lunch and left for the airport before dinner so I would’ve eaten almost anything, but this meal made me completely regret asking for a vegetarian meal. I could’ve simply ordered off the menu so I was disappointed. 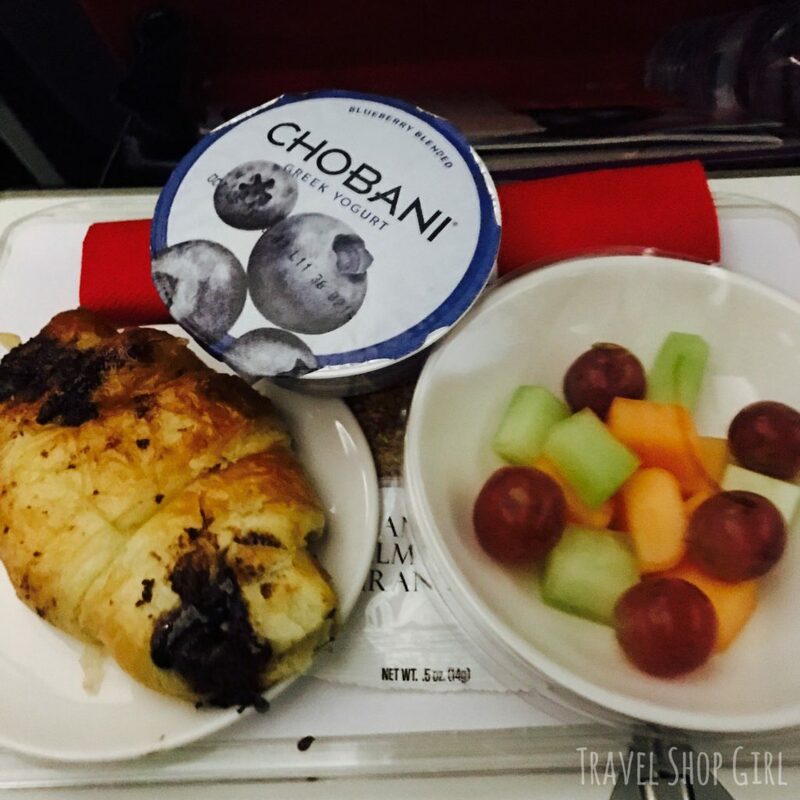 Before landing we were given a breakfast tray with yogurt, granola, fresh fruit, and a warm chocolate hazelnut pastry. They were warm and gooey and I easily could’ve eaten a dozen more. 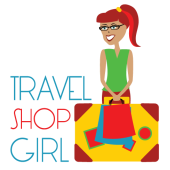 When we landed, it was a fairly quick process of deplaning, going through Customs, and grabbing my bags to head into London. After my cruise with Fred Olsen Cruise Lines, I spent a few days in London before returning home. I arrived back at Heathrow only to discover Terminal 3 was packed with students because it was mid-term. The lines were ridiculously long and not moving at all. I think part of this was because half of the desks were converted over to check in for Delta Sky Miles customers. I was behind a family with three huge luggage carts and a baby. Feeling a little pre travel anxiety, I never thought I’d be able to check in, but then the family jumped out of the line and I was at the front and ready to check in. I dropped off my luggage, went shopping in the terminal, and then it was time to get to the gate. 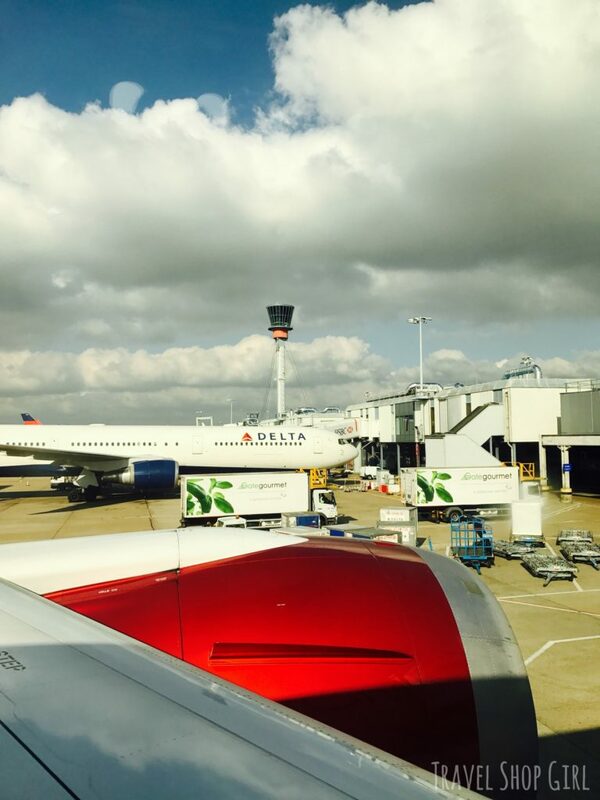 TSG Tip: If you haven’t flown out of Heathrow, here’s a tip. They won’t post your gate until about an hour before your flight. Keep an eye on that and when it is posted, make your way to the gate as soon as you can. Even though I have flown out of here numerous times (I now have a UK Registered Traveller card to skip the long lines upon arrival into the country), I took my time and didn’t check the gate until about 12:15 pm. On my boarding pass it said the gate would close at 12:30 pm. When I started walking to the gate I noticed a sign that said it was a 20 minute walk to my gate. I walk fast and made it there in probably 5 minutes, but if you have children, difficulty walking, etc. 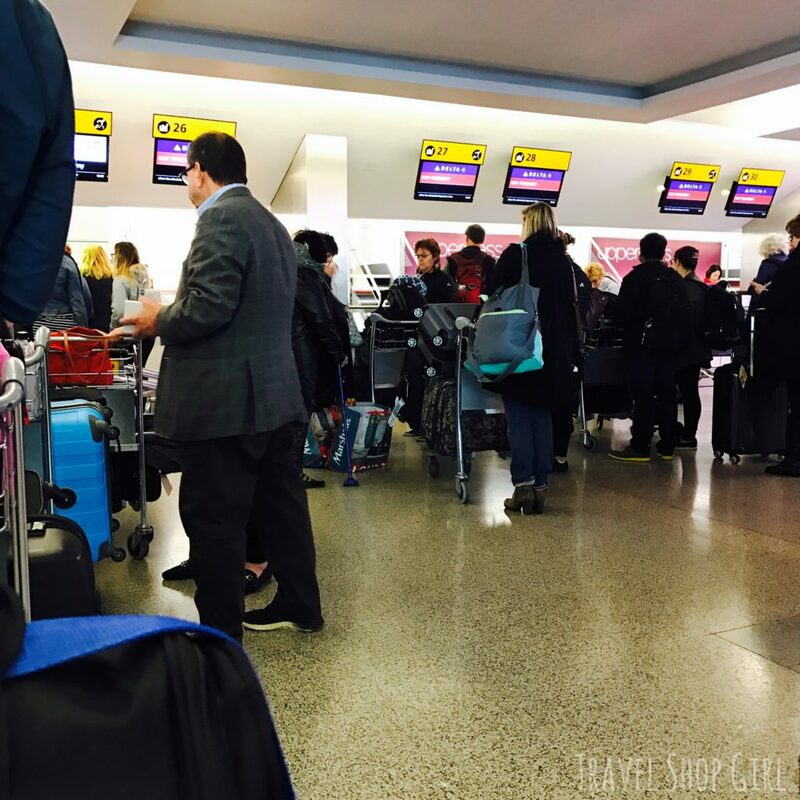 don’t postpone your walk to your gate or you might miss your flight. 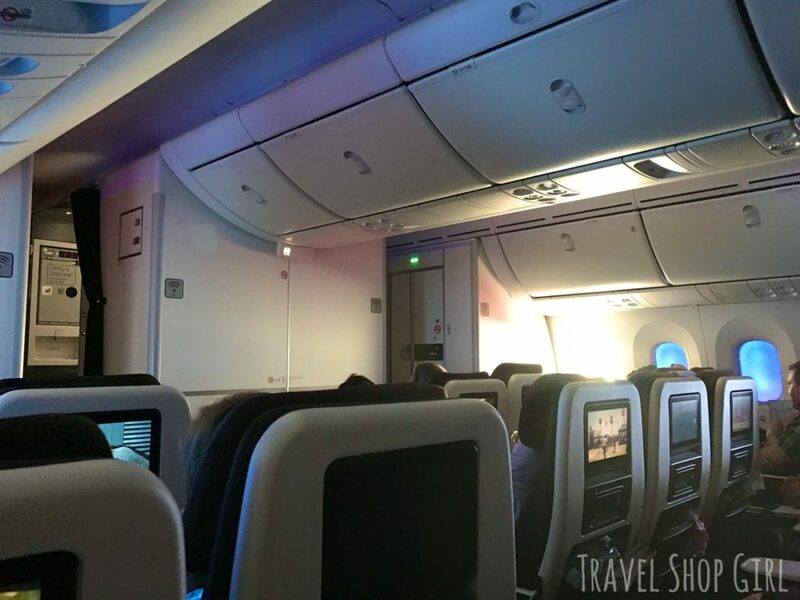 I discovered once onboard the flight that our plane had been switched out and we would now be flying one of the new Boeing 787 Dreamliner back to Boston. I was pleased as it was a definite improvement over the Airbus A340 I flew to London. 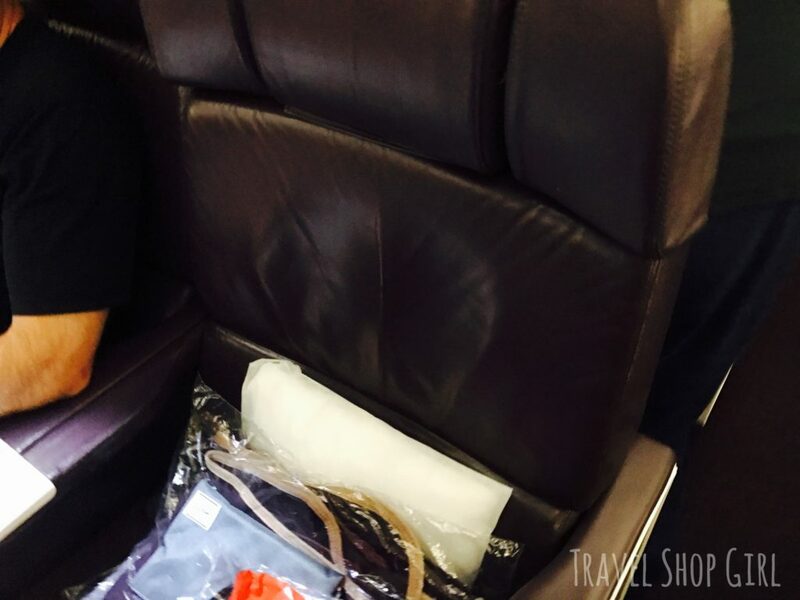 You can immediately see a huge difference in the Virgin Atlantic Premium Economy cabin from this first image. 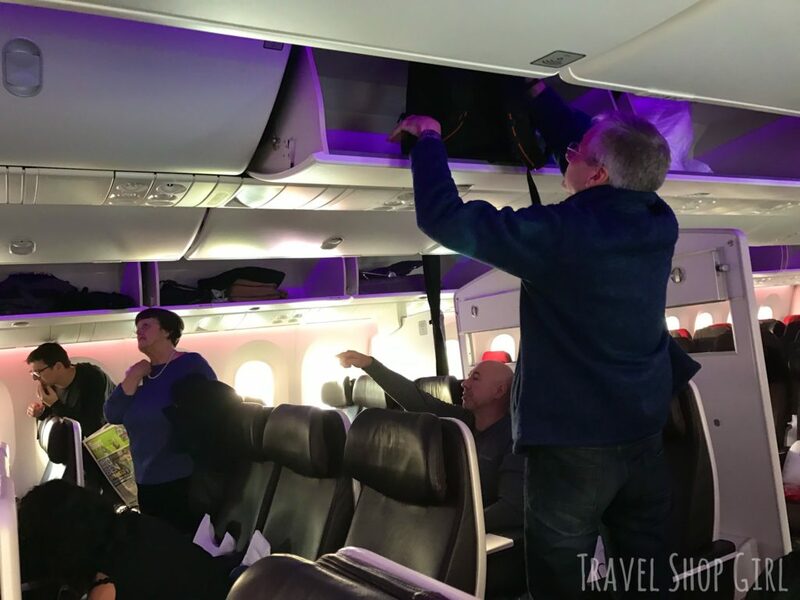 Instead of having to lift the door up on the overhead bins, these open downwards when it’s time to put anything in or to take anything out. This also provides substantially more headroom as well. 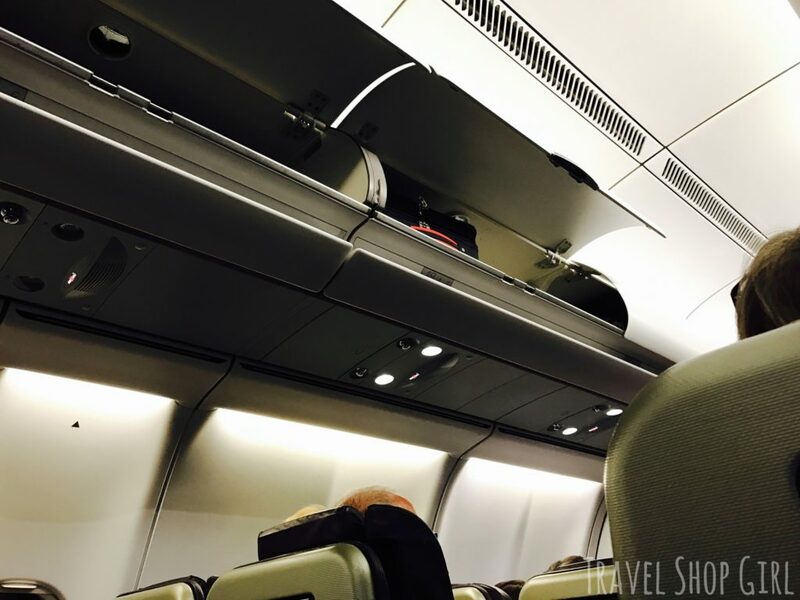 The cabin has the same 2 x 3 x 2 configuration, but with more comfortable seats that are up to 21″ in width. The seats have a footrest, headrest and a 38″ seat pitch for more space and legroom. While no amenity kits are provided for day flights, I was definitely happier with the improved comfort on this newer airplane. 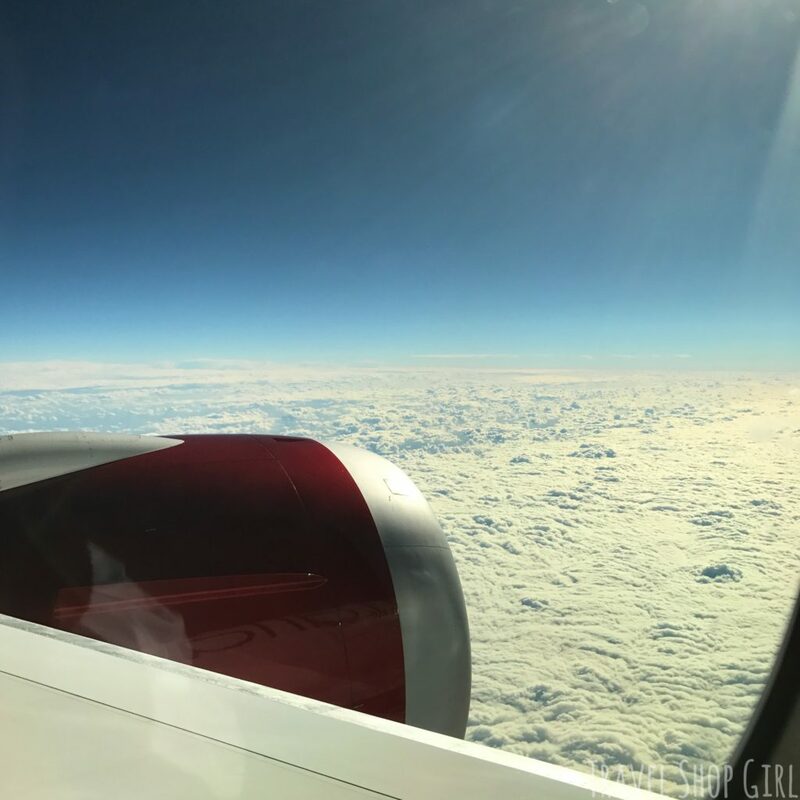 I enjoyed my last few seconds of England looking out the window while the crew offered a complimentary beverage of champagne or orange juice and a newspaper to Premium Economy passengers. 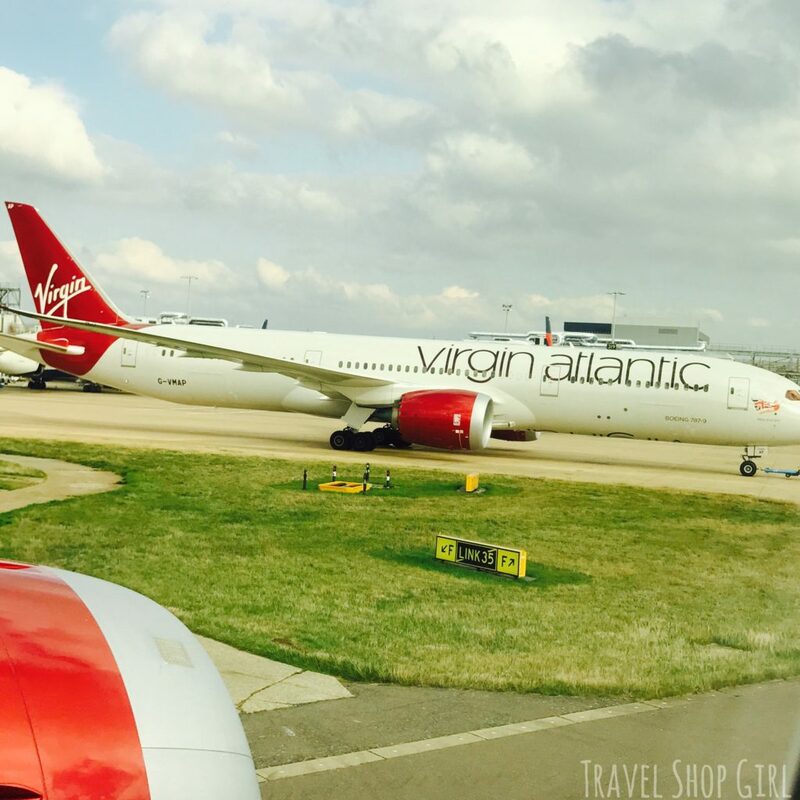 As we left the gate and began our departure, I snapped a pic of another Virgin Atlantic jet. 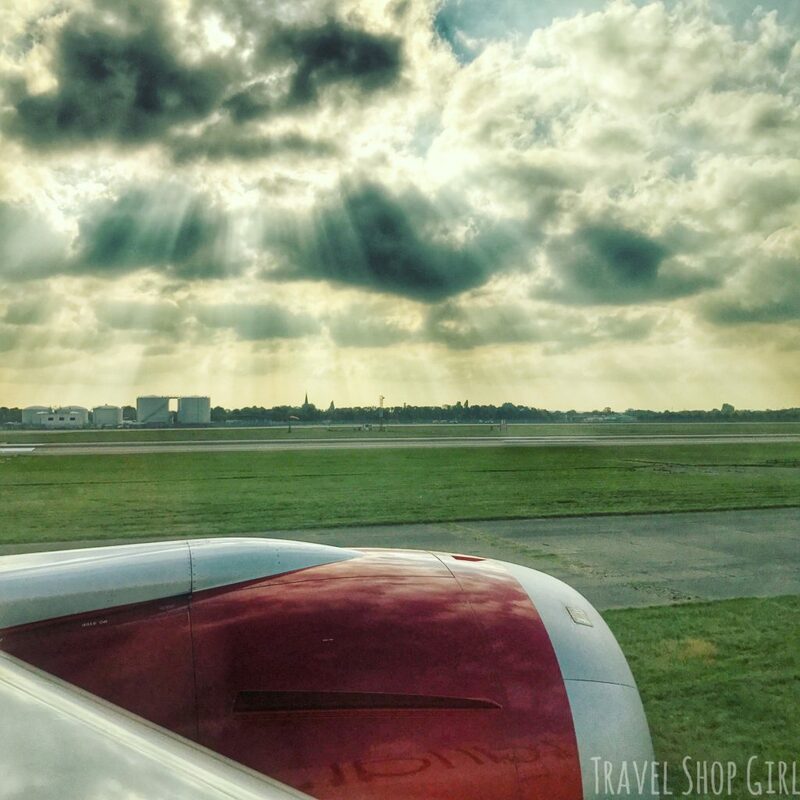 While waiting to take off, the sky looked absolutely heavenly reflecting off the shiny red airplane. After takeoff everyone settled in for the 7 1/2 hour flight to Boston. I was just happy to sit and relax after all of my running around at the airport. 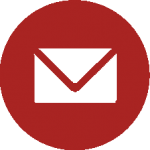 TSG Tip: Hungry, thirsty, or just need to get up and move around? Check out the Wander Wall, where you can get up and stretch your legs and grab a beverage or a snack. 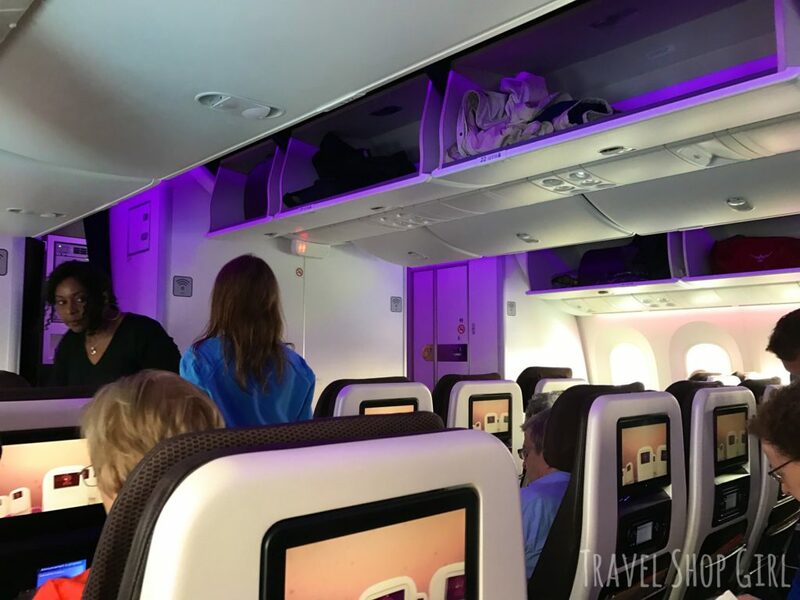 The mood lighting on the Dreamliner adjusts to the different stages of the flight like dining vs. sleeping. 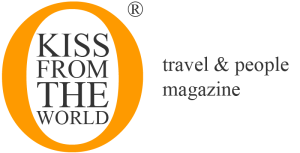 It also adjusts to the time zone, which they say helps you feel “brighter and less jet lagged” upon arrival. The in-flight entertainment center (Vera) is controlled through the touchscreen or a separate handset, which I set to show the in-flight map. You can listen to music, watch TV or movies, or play games during your flight. I connected my phone to the USB port of the entertainment center and my Beats headphones to the audio jack and settled in for the duration of the flight. This should be a sign to all that I’m probably not going to engage in conversation with my seatmate, but still people try to talk. Why is that? 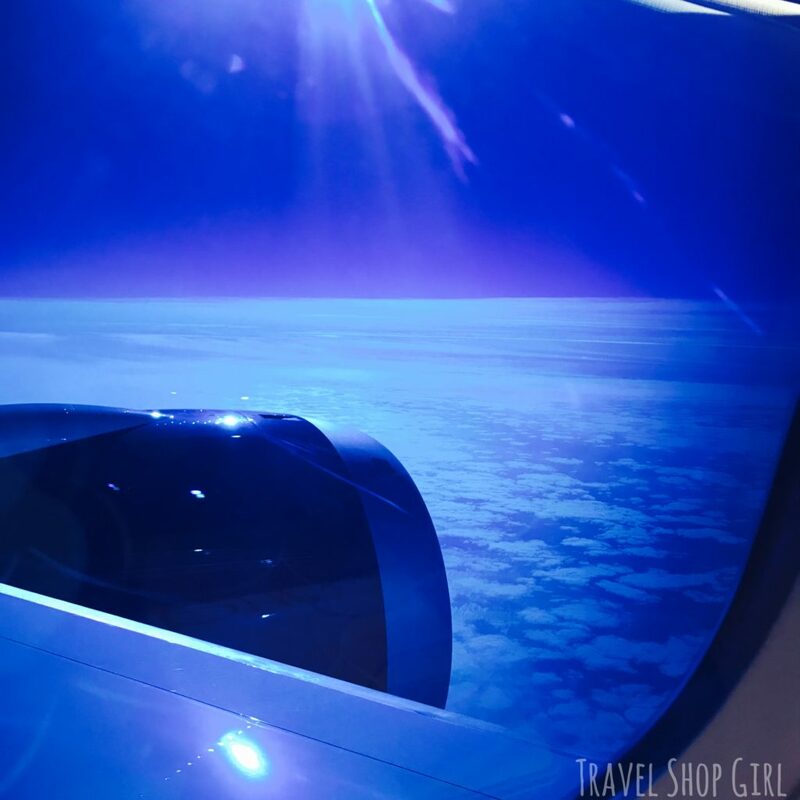 The windows on the Dreamliner are large, which makes for great views looking out during your flight. Looking out with the window slightly dimmed. But they also offer electronic lighting, making them dimmable with a simple touch. That means no more pulling the shade down when the sun is too bright so you can dim it and still see outside. I should’ve ignored the menu altogether as I knew I wouldn’t be able to get any of the good food. I even asked if I could just get the regular food, but was told since I had pre-ordered the vegetarian meal, that’s what I would be getting. I knew I should’ve picked up a cheese sandwich in the terminal because my salad was definitely not the butternut squash and pecan salad listed in the menu. I did receive the same spinach and ricotta canneloni, but it was a sad little entrée and no sticky toffee pudding for me. Instead I received and never opened a little cup of chocolate caramel truffle pudding, which I chose to ignore and act like it never made its way onto my tray. I was holding out hope for afternoon tea as when I flew Upper Class, the afternoon tea service was quite an event. However, Virgin Atlantic Premium Economy afternoon tea for vegetarians is a different story. I received fresh fruit and a sandwich wrap as a substitution. I asked if I could have a scone, thinking I’d get a plate a scone, some butter, some jam, and clotted cream (or not — I’m not picky), but I was handed a scone and nothing else. I did like the mug that my tea was served in, but that’s about it. TSG Tip: If you’re a vegetarian, don’t pre-order the meal as you’ll have more choices without than with the pre-order. Although it clearly states on the package that the meal choice is lacto-ovo (that’s dairy and egg), my meal on my flight out as well as afternoon tea were vegan while my meal on this flight contained dairy. 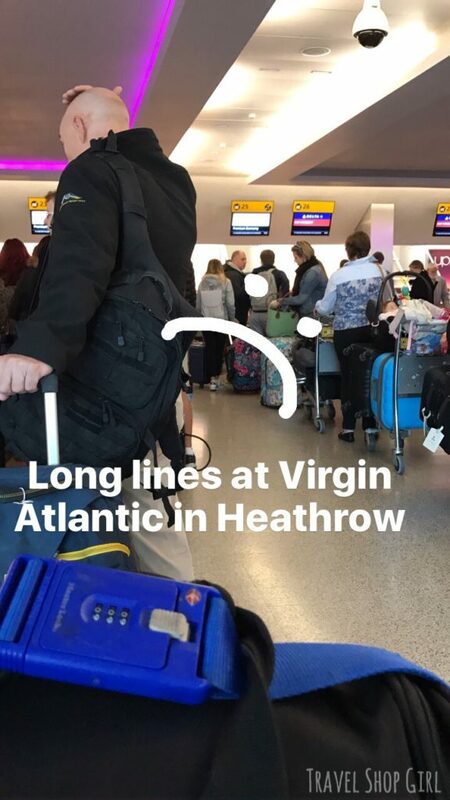 I hope that Virgin Atlantic considers educating their chefs and food preparers on the differences between vegan and vegetarian in the future. 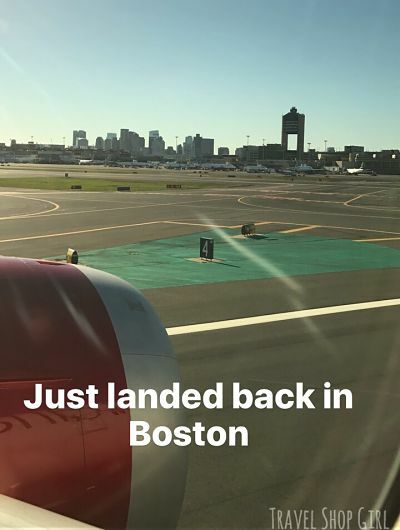 After nearly 7 1/2 hours, we finally arrived back into Boston. I literally flew past the three planes full of people waiting to enter the Customs hall and went right over to the Global Entry kiosk. 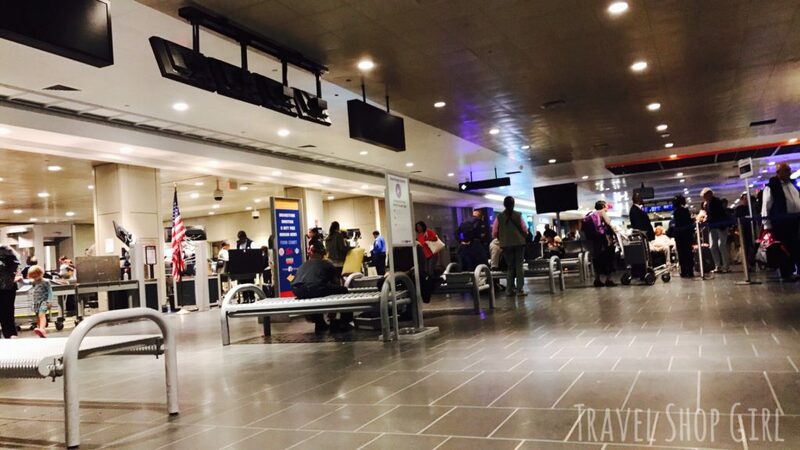 From there I zipped down to baggage claim and was one of the first to arrive. Virgin Atlantic Premium Economy bags are tagged priority and are supposed to be placed on the belts in baggage claim first, but, unfortunately, that didn’t happen for my bags. That’s more of an airport issue than an airline issue, but thought I’d mention that. Overall, I was pleased to not be squeezed into either the 2 x 4 x 2 or the 3 x 3 x 3 configuration in Economy and for that I’m always happy. However, the food issue and lack of USB port on my outbound flight left me a little dissatisfied. I will definitely try Virgin Atlantic Premium Economy again in the future, but will skip pre-ordering a special meal. 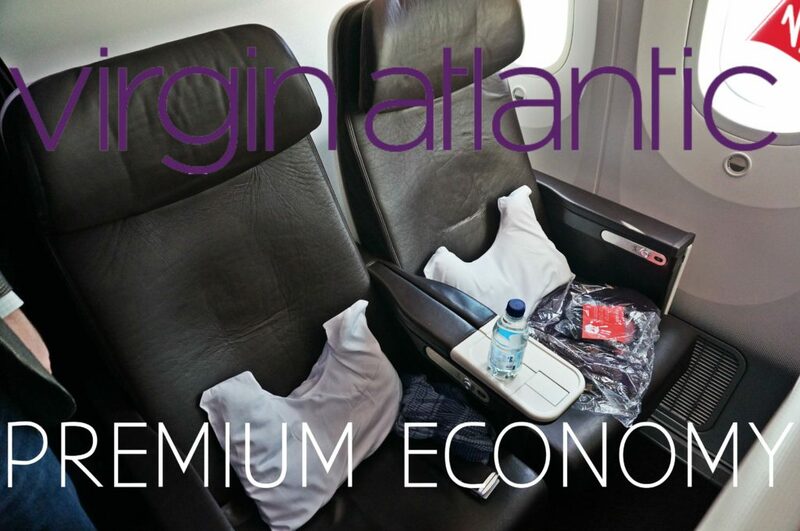 Have you flown Virgin Atlantic Premium Economy service to or from London? What are your thoughts on this class of service?